Preheat the oven to 180 degrees – top and bottom heat. Coarsely chop the chocolate and melt it in a pot together with the vegetable cream. Stir in the sugar and oil. Flavour the chocolate mixture with the gingerbread spice, salt and cocoa and finally stir in the flour and baking powder. Cut the gingerbread into cubes, fold them in, put them into paper cups in a muffin tin lined with 12 cups and bake for about 20 minutes. Leave the gingerbread cakes to cool in the muffin pan for at least 20 minutes. While the muffins are cooling, stir the starch with 2 tablespoons of water until smooth. Bring the orange juice together with the vanilla sugar to a boil, add the starch and the cherries while stirring and simmer briefly. Sweeten to taste and keep warm until serving. 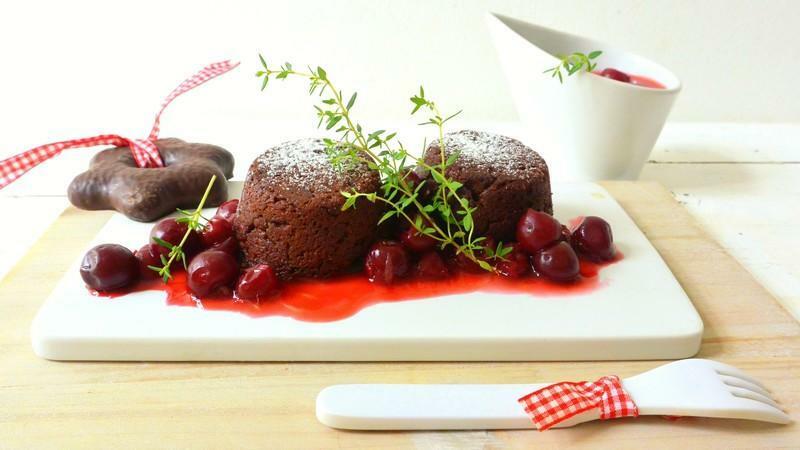 Carefully remove the lukewarm mini cakes from the paper cups, place 2 pieces each on a dessert plate with the top down and serve together with the hot cherries. Dust the cakes additionally with powdered sugar! For particularly refined nuances, you can flavor the hot cherries with fresh thyme - and, if desired, also with a little untreated orange peel. Do not remove the muffins from the moulds too early so that the dough holds together sufficiently.